20 years ago, on 24th of March 1999, Nato attacked the Federal Republic of Yugoslavia, which was Serbia and Montenegro at that time. The air strike were the beginning of the final act in the Kosovo War of Yugoslavia and the breakaway province of Kovovo, which wanted to create its own state. 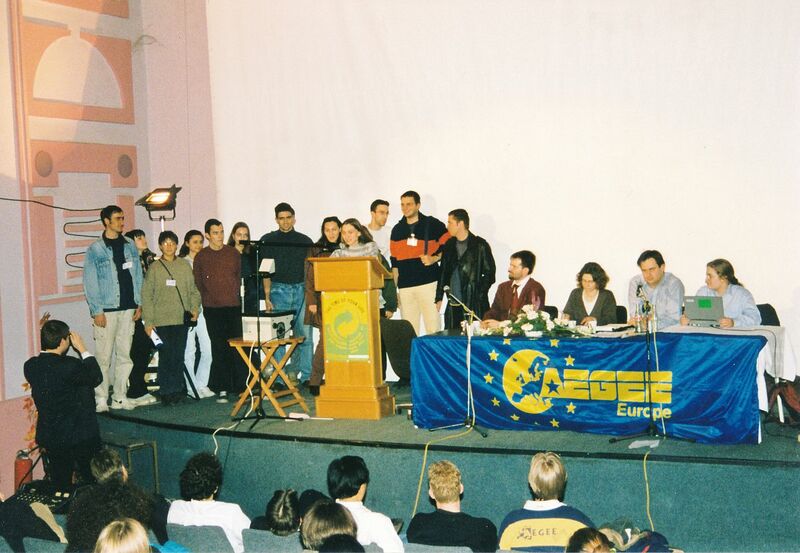 Two weeks before the Nato bombing on Serbian towns, from 5th to 7th of March 1999, altogether 275 AEGEE members gathered for one of its statutory events, the spring Presidents Meeting in Novi Sad. 275 delegates attended the Presidents Meeting in Novi Sad. There were quite some concerns when the conflict started to heat up. 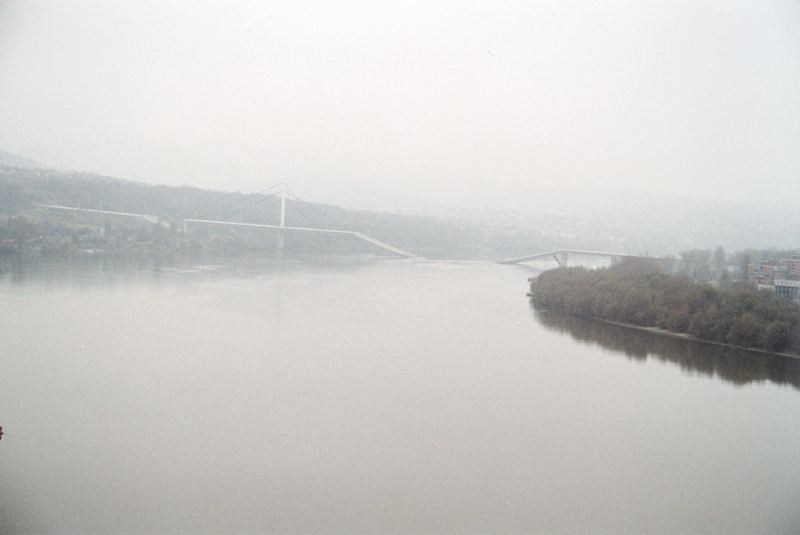 Novi Sad was in the north of Serbia, far away from the conflict zone. Nevertheless, it was the same country and no one knew if, when and how Nato would side with the Kosovo Liberation Army to defend the people in the province from the Serbian attacks. 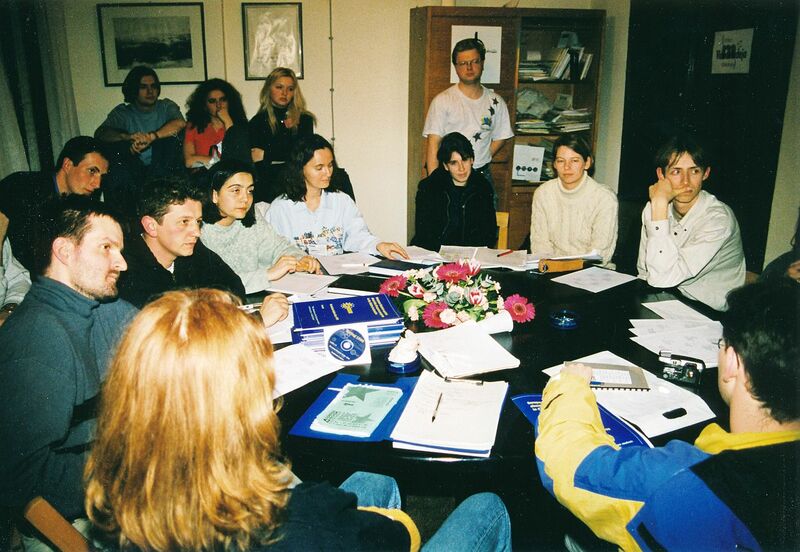 There were quite some voices that raised doubts on the AEGEE mailing lists whether the Presidents Meeting (PM), which is a predecessor to today’s EPM, should actually take place there. 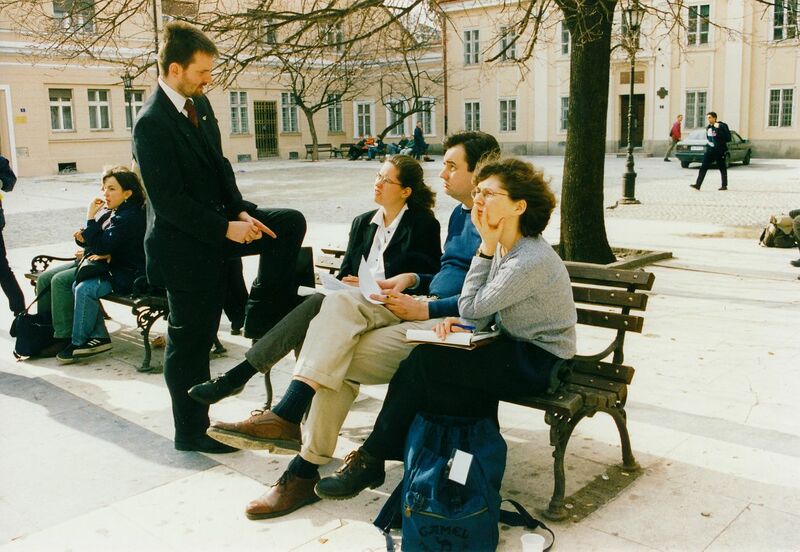 In a time, when AEGEE was much more political than today, there were also fierce discussions whether a Nato involvement was actually justified. 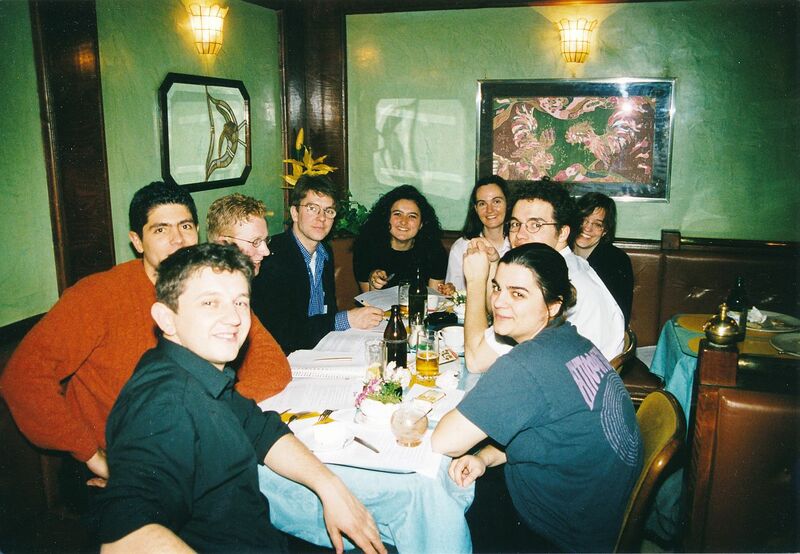 Yes, these were heated times in AEGEE. extreme and unforeseen conditions we have to face at the very moment. and fellow members on the personal level, too. want to take some kind of spontaneous blind actionism - in neither direction. the crisis and only then we can, and will, take any final action. AEGEE-Europe president Stefan Seidel (standing) checked for the last organisational matters. So, yes, the Presidents Meeting took place. It turned out to be a fantastic event, extremely well organised by a very capable antenna. The team around President Jasmina Bogdanović had organised several spectacular events before and enjoyed a great reputation in the network. This surely played a role in the fact that there were 275 participants. I published the following report about the event afterwards, so you can see that despite the circumstances, AEGEE made business as usual. Well, almost, the PM Chairwoman did not come because of the Kosovo War, and neither did the Vice-Chair, although this was for different reasons. The concerns turned out to be unjustified, but only for a few weeks. 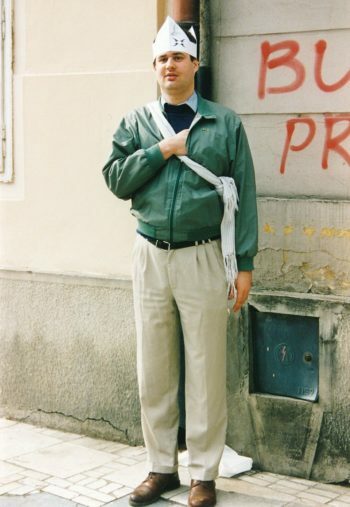 When Nato started their air strikes, also Novi Sad was hit by bombs. Among others, the bridges of the city were destroyed, which gave the participants a strange feeling, because everyone had walked on these bridges just a couple of weeks before. Here is the report, which is focussing mostly on the internals of the event, because during the event we were like in a bubble and did not realise the growing tension in world politics. Some things might be strange for you. For example, it was normal that CD members were elected at both Agoras and started their term on the very next day, without transition period. Or: the Summer University booklet was the main promotion tool for the SU project, it was abolished just a few years ago. The CDs with the SU programme refers to the fact that there were no online applications yet. 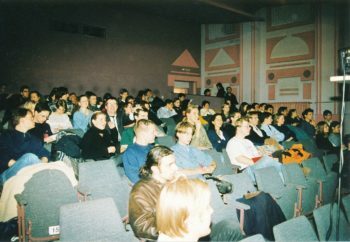 1999 was the year in which electronic applications were introduced, but applicants sent the applications to their antenna, which then handed a floppy disc with all applications to the SUCT at the Agora. Jasna Bogdanovic was the heart, sould and brain of AEGEE-Novi Sad. PM Chair Egens van Iterson Scholten. Sleepless organisers, relaxed plenaries, sunshine, great parties: These were some impressions of the spring PM, taking place from 5-7 March 1999 in Novi Sad. It was a PM for the “die-hards” of AEGEE, the people that like to travel across Europe against all obstacles. So you could see plenty of oldies around, lead by ex-president Eggy van Iterson Scholten, who was chairman of this PM, because chairwoman Filippa Bengtsson did not come. The biggest group from one foreign antenna was sent by AEGEE-Lviv – their bus had 26 members of Oleh Kyriyenko’s fabulous funtenna on board – nearly 10 percent of the 275 participants. After everybody got visa, arriving for most participants was without problems. Just the CD (Comite Directeur) had more problems, because of some hundred CDs (Compact Disc) which contained AEGEE stuff and the SU application programmes. They were stopped at the border, because the Serbian guards thought these CDs would be sold. Only after intervention of AEGEE-Novi Sad the CD and CDs could pass. Dan Luca and Metin Turan did not go to Novi Sad – due to visa problems they couldn’t attend the PM. For the organisers this was only another one of the many problems they encountered – and solved. The team around president Jasna Bogdanovic and the antenna’s shooting star Sasa Vicko did a marvellous job. For an amount between 5 and 10 euro the participants were lodged in hotels, got three meals per day and free admission tickets to the parties, next to free public transport. However, hardly anyone ever took the bus, since the taxis were incredibly cheap. Actually, most people got along without changing any money at all, since most shops and restaurants accepted D-Marks. Especially the pizzeria opposite the cultural centre that hosted the PM must have made an enormeous amount in DEM, since it was always filled with AEGEE people. One of the big projects of 1999 in AEGEE was the Peace Academy. The organisers met during the PM. Before the PM people expected fights about the presidency, since the current CD told on AEGEE-L that they won’t support Stefan Seidel anymore after the Agora in Barcelona. But on the surface of this PM nothing at all was visible. No split in the CD was visible, everyone was nice to each other. Stefan Seidel was in a good mood and made many jokes. However, in the background of the PM rumours about a vote of confidence at the next Agora were very strong. Additionally, the Moral Report left many people in doubt. In a rather dull presentation Stefan Seidel tried to surpass all problems. Instead of describing the work of the CD he tried to bore people to death. The moral report was rather sort of a Speed Course on AEGEE in general, because Stefan listed all commissions and other bodies and explained their functioning in general, although this had not much to do with a moral report. However, the happy participants did not bother the CD with more than a handful of questions, since everyone in the plenary was in a good mood. Same counts for the finances. Helen Kuyper, who takes over more and more responsibilities in the CD, gave a clearly structured presentation about the current state of the AEGEE-Europe finances. The effectivity of Helen’s performance was similar to the one by Markus Schoenherr in Maastricht last year. Both used a direct, detailed and open approach, with of course not stressing too much the flaws in the finances. If the CD works on the reports until Barcelona, and in case Stefan and Helen will give a similar performance in Barcelona, the moral report will fail and the financial report will be accepted. Among the many discussions was a meeting of the Network Commission with the CD and the Task Force. As early as hardly ever before, the new CD is taking shape. At least everyone thought so. Helen, Metin and Goosje wanted quit – and three candidates wanted to take over. All of them attended the informal meeting of CD candidates on Saturday night. Oana Mailatescu (NetCom, President AEGEE-Cluj) wanted to run for secretary – and indeed got the job. Barbara Bolta (Treasurer AEGEE-Ljubljana) wanted to go for Treasurer, but withdraw her candidature. And a funny guy from AEGEE-Novi Sad (whose name no one understood) wanted to be the next IT responsible. After the questions regarding qualification and motivation, the remaining CD members were very interested in practical questions like: “Can you cook?” Answer: “No, but I have a car.” He never candidated. After years of nothing to do, the Members Commission has to deal with two issues: the antennae in Chsinau and Kyiv. The commission met twice during the PM to discuss this matter, final results are to be expected at the Agora. The Task Force is everywhere: Hardly any AEGEE body had so many meetings and workshops as the Task Force. It was basically everywhere. Overhead projectors have their benefit: the Blonde Award ceremony. How to secure a better handing-over of the work of two CDs? This was discussed in another workshop. The favourite suggestion bases on a Dutch model: Electing the CD at the Agora, but the term starts only some weeks later. Until then the old CD is in charge and has to introduce the new team to its work. Moreover, in this period the new CD could lean in a “CD European School” the basics of intercultural management. 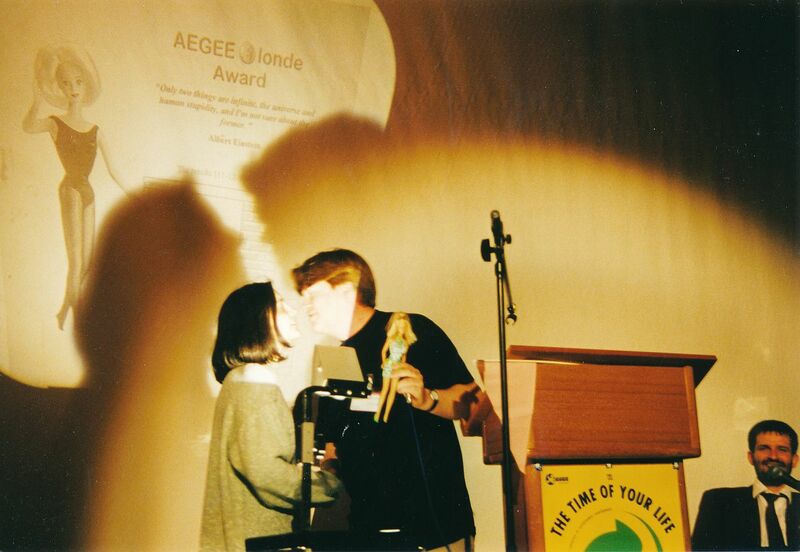 In a 15-minutes-show Michiel van Hees presented the results of the AEGEE Blonde Award of 1998. The Socrates Action Day proved to be top in this attitude. Dark-haired Oana Mailatescu (who was actually innocent among the blond SAD people, but she was the only one to be around at the PM) received the prize: a Barbie doll. Lots of applause for the local organisers. The SUCT is front-runner for the next Blonde Award. They made a beautiful and professionally looking PR poster and SU book. But they forgot Michiel van Hees’ prime directive concerning publications: “Lay-out is important, but content is even more important.” Why? Well, the pages of the SU book are unnumbered, which doesn’t matter anyway anymore since the book neither contains a table of contents, a list of courses according to the topic, a list of courses according to the dates, nor a list of contact people in the organising antennae that might be able to provide additional information. A lot of more things happened at the PM. Some people were angry because the next AddressBook won’t appear before the Agora in Barcelona – the previous one was published in July. Anyway, all this was forgotten during thanks to the amazing hospitality of the organisers and also because of some great parties. For delegates and the CD it was a nice and easy time, before it’s getting serious again – in Barcelona. Two years after the PM not all bridges were reconstructed.